Perfect summer music here as Sydney’s RÜFÜS get the remix treatment on their latest EP. 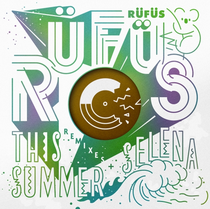 With four mixes of ‘This Summer’ and two of ‘Selena’, there should be a mix to suit most people here. Keeping with ‘This Summer’, Parachute Youth and RÜFÜS themselves supply remixes, RÜFÜS’ stripping their original back whilst PY give it a very laidback 4/4 rendition with a great breakdown in the middle. Softwar’s mix adds a great old skool piano to it, capturing great memories of some classic house music. Best mix though is the JBAG one with its nu-disco vibe, allowing a great song and tune to flourish, creating a lovely summer vibe. Lancelot and Frames remix ‘Selena’, with Frames’ remix shading it for us with its good beats and atmospheric breakdowns which all compliment the song. The track is already out and been getting good support from acts such as Punks Jump Up and In Flagranti, so it’s a good release for the label. RÜFÜS consist of George, Lindqvist and Hunt, a self-taught folk singer/songwriter, a deephouse producer and a 4/4 driven drummer although we have to confess to not knowing who does what. They already have quite a cult following and this latest release should only add to that. If you’re feeling it as much as we are, look out for their debut album next year.